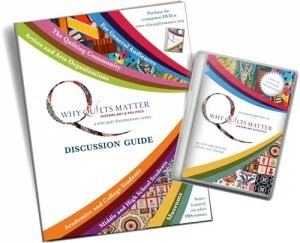 You can now purchase the new 56-page, softcover, full-color Discussion Guide, and the two-disc DVD set of the landmark nine-part documentary, Why Quilts Matter: History, Art & Politics, in a specially priced package for just $51.95 plus shipping (represents a $6.95 savings if purchased separately). This package is perfect for quilt and fiber-arts groups, libraries, classrooms, and museums. Enjoy the series and then use the Guide, with its stimulating, audience-specific questions, to “continue the conversation” episode by episode with friends, students, colleagues, and more. 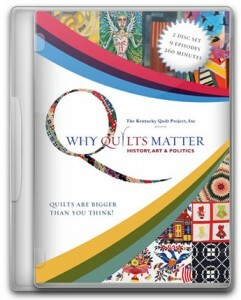 Click on the Add to Cart button to purchase your specially priced Why Quilts Matter DVD/Discussion Guide package for just $51.95. 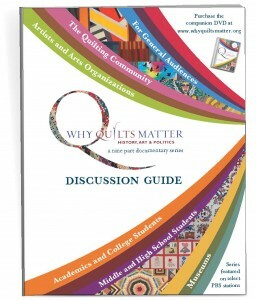 Why Quilts Matter: History, Art & Politics Discussion Guide, is a fabulous NEW 56-page comprehensive, group-friendly discussion guide that will help you “continue the conversation” and explore the ideas presented in the landmark nine-part documentary series that has aired on more than 200 select PBS stations. Note: The funding and production of this guide was accomplished using profits from sales of the DVD documentary Why Quilts Matter: History, Art & Politics and through the generosity of many supporters and volunteers.